The term superfood is usually used to describe nutrient-rich food that is especially beneficial for our health and well-being. Certain yoga poses can be described as “superposes” because they also carry incredible “nutritional value” for our bodies. Below is a list of poses that I consider to be “superposes” because they are benefit-dense, accessible to most students and offer multiple options. They are arranged in five groups of four and represent a gradual progression from most foundational toward more challenging. If you choose to build your yoga practice on those instead of chasing after the fancy exotic ones, you will end up having a rich, satisfying and “nutrient-dense” yoga practice. You can get all those adaptations in a book. 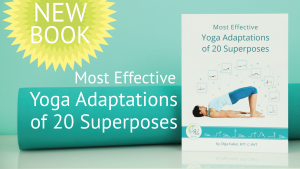 This book covers various adaptations of 20 superposes and reasons for doing them. They are meant to inspire your curiosity and creativity and to facilitate a new type of thinking in regards to yoga poses. All pose adaptations above are available in our yoga sequence builder and can be easily arranged in a sequence. This is supergreat, Olga — thanks! I love this notion of ‘superposes.’ Very clever! And these poses are all on the top of my list, too. Well done. I use these poses on a regular basis too. It’s great to be educated on all the variations they can take as well. Thank you! Love it! I would love to have a poster of these super poses. Do you have one available or would you consider publishing one? This is great inspiration! Thanks. Happy to hear that Barbara, thank you!